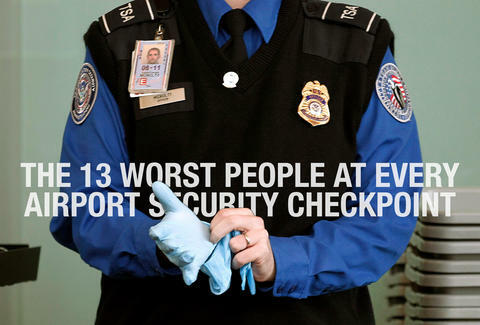 Each time you fly, you face a pivotal decision that will set the entire tone for your travels: which TSA line will yield the least soul-destroying experience? Fortunately, we've isolated the 13 worst types of fellow line-mates and agents -- steer clear of these selfish/senseless/strollered saps, and you'll actually stand half a chance. 13. Extended Family Lingering with Departing Relative Yes, by all means, please walk alongside everyone waiting to continue your conversation with your nephew when he finally returns from the other side of the snaking line. 12. Egregious Liquids Lady She checked three suitcases, but didn't throw in her full-sized shampoo and conditioner because she "didn't want them to leak". Look, your soft curls sure ain't getting us to the gate anytime soon, so why don't you stop arguing about what constitutes a "liquid", finish your 60oz Evian, and start transforming into Spends 20 Minutes In The Plane Bathroom Lady already? 11. The Stroller Family Not only do they get to skirt the line you just waited in for an hour, but once they hit the conveyor belt the act of keeping their hellion brood in one place for thirty seconds becomes impossible as mom and dad become preoccupied with folding up the stroller, both of which are two of the simpler tasks on the planet. 10. The Elderly The same people who had trouble turning off their TV this morning are now navigating the world's most advanced security system. Taking 15 minutes to undo Velcro shoes feels like an elaborate prank all old people are in on. 9. Too Much on his Person Guy This dude manages to have no less than two laptops, phones in three different pockets, lace-up shoes with a buckle (why?! ), a watch, a belt, bracelets, a necklace, and, like, six rings...on one hand. Oh, you need to slowly take those off at the last possible second? Please, take your time, it isn't like the rest of us are here for a scheduled departure or anything. 8. Must Put Everything Back on his Person Guy The version of Too Much On His Person Guy insists on putting himself entirely back together again before he leaves the conveyor belt. Bonus points for checking voicemail and responding to emails between shoes. 7. Thinks He's a Cop TSA Agent Noticeable because of his perfectly crisp uni, military cut, and mustache, this dude had some vision problem that precluded him from being a Texas Ranger/Green Beret/other no-nonsense, emotionally unstable occupation. Now, fresh from mall security, he's been called up to the big show. No joking with this dude, 'cause he'll tase you. Twice. In the nuts. 6. This Body Scanner Violates My Rights Lady She'll launch into a half-cocked rant about how full-body scans violate her fourth amendment rights. To you. In line. 10 minutes before she's even at the scanner. Here's an idea: if you don't want your rights violated, then DON'T FLY ON A GODDAM PLANE!!! 5. Clueless About What Sets Off Metal Detectors Guy "Take your watch off, sir." BEEP. "Take your belt off, sir." BEEP. "Do you have keys in your pocket, sir?" BEEP. "How about change?" BEEP. 4. My Plane Leaves in 10 Minutes Guy This guy screwed up by misjudging how long he'd need at the airport, and now it's on literally every single person ahead of him in line to make sure he catches his plane. This is also the same guy that tries to rush to the front when the plane has landed. 3. Accidental Weapon Guy Just because you love Survivorman doesn't give you a license to keep a pocket knife on your keychain. 2. Non-Accidental Weapon Guy 60% chance he's married to This Scanner Violates My Rights Lady. 100% chance he'll start talking to her about the Constitution. 1. Hungover, Disinterested TSA Agent Come on, man, at least try to catch Non-Accidental Weapon Guy! There's a good chance this dude was inspired to get a job with the TSA after watching Jay Baruchel's character in She's Out Of My League, only this is real life and dudes from Pittsburgh don't score 10s.